The Frankfurter Flugzeugbau Max Gerner GmbH was taken over by the Adler-Weke AG 1/1 1934. A special branch , the Adler Flugzugbau, was created. Josef Jacobs was appointed manager working together with Hans Gustav Röhr, the Technical Manager of the Adler-Werke. Jacobs was an ace from WW 1 with 41 kills and had the Pour-le-merite. Together with Ing. Walter Schilo, former head of Siemens & Halske Werksflugerprobung (Testing departmen of aircraft engines). The serie production of the Gerner light plane as Type G IIRb was started at once. 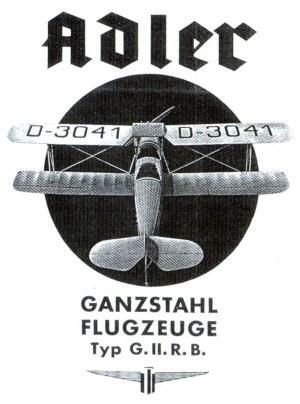 Already at the Deutschlandsflug in June 1934 14 G IIRb took part. Because of a crash, the 2 pilots were killed, an investigation was started by the RLM. This led to a stop of all flying with this type. A total rebuilt was neccesary, swept backward wings - larger rudder, ailerons, elevator - new structural calculations to achieve a higher flying weight. The new type was named G IIRc. Was accepted early 1935 but only a few were built. The Adler could not compete with the new modern designs. The Gerner company was by itself again from early 1935. Totally was 31 aircraft built.